Whew! Look at the mess. Confetti everywhere. Cupcakes wrappers dangling from the ceiling fan. Crumbs in the sofa. Popcorn littering the house. I don't know what it looks like at your house, but we partied here. Thanks for coming to my book launch party. Thanks for celebrating with me. Thanks for being great friends and offering support. Now I'm getting all sniffly. Sorry, allergies. Okay, one prize left - the GRAND PRIZE. Anyone who commented during the party is entered once. Anyone who leaves a comment before midnight Sunday will be entered, too, just in case you had to miss the party. Grand prize winner will be announced Monday morning. Along with the other winners. I'll be in touch to for addresses, which is why I want your email. What is the GRAND PRIZE? Glad you asked. 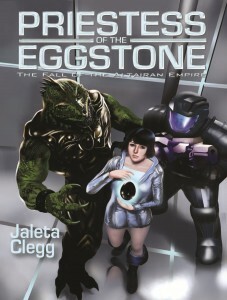 Check out Priestess of the Eggstone, if you haven't already. A cup clattered onto the floor behind us. Leon twitched, the cold barrel of the stunner prodded my cheek. I flinched. Let Leon think I was scared, let the Patrol and Station Control think I was scared. This just might work to get me off the hook with the Patrol if I played it right. "Who's back there?" Leon took a step to the door of the cockpit. "Get us out of here." He waved the gun nervously. I flipped on the com, keeping half an eye on Leon as he tried to peer into the cabin without moving me out of his gun sights. My left hand crept slowly over the controls to the engine starters. "Viya Station, this is Twinkle," I said into the mike. "Go ahead, Twinkle," the same male voice I'd talked to earlier replied. "Requesting immediate clearance for undocking." Leon craned his neck farther around the door, trying to peer into the cramped cabin while still keeping the gun on me. I could have knocked him down and taken it away any time, except that wasn't what I wanted. I didn't want to spend the next six months in Patrol custody answering questions and possibly facing life in prison for smuggling. They weren't going to believe I knew nothing. Nobody was that stupid. "Sorry, Twinkle. Viya is currently under lockdown. You will open your hatches and allow the Patrol to board your vessel." "You don't understand," I said, lowering my voice and doing my best to sound scared. A muffled thump came from the cabin, followed by an ear-shattering scream. Jerimon had decided to play hero. I hoped the scream carried over the mike. "There's a maniac in here with a gun who is going to shoot me if I don't fly him out." Muffled talking carried over the headset. It sounded urgent. I grinned. Leon and Jerimon smashed into the table, then crashed onto the floor. "Twinkle, what is your status?" a new voice, a very mature, concerned voice, asked. This was too perfect. "There is a maniac with a gun who is demanding I fly him out," I said, trying to get just the right note of panic in my voice. "You have to let me undock!" Jerimon and Leon stumbled into the cockpit, landing across the control panels and slamming my seat against the wall. My left hand hit the starters for the engines. They came to throbbing life. The men wrestled over the gun, slamming into controls. Alarms shrieked through the cabin. "Twinkle, what is happening now?" Whoever owned the concerned voice sounded a lot more worried. "We are showing your engines running. Shut them down immediately." "He won't let me. He's going to take out the docks if you don't let us go!" Leon's gun went off. The shot ricocheted through the cockpit. Jerimon jerked Leon backwards. Leon shouted incoherently and flailed at Jerimon with his free hand. More alarms beeped and shrieked. I turned up the gain on the mike to register as much noise as possible. I goosed the engines slightly just to add to the confusion. "Shut the engines down, now!" the very worried voice ordered. "He's going to shoot me! He's going to kill me!" Jerimon and Leon tumbled into the cockpit, landing in the copilot's seat, Jerimon on the bottom. Blood dripped from his nose, one eye swelled shut. Leon foamed at the mouth. The two of them yelled so loudly I couldn't hear what the worried voice said. The engine warning lights edged over into yellow. It must have sounded like total pandemonium to Viya Station because within moments the ship jerked as the emergency releases kicked us free of the station. I shoved the throttles to full, twisting the nose of the ship away from Viya. Leon landed on my lap, shoving the steering too far to the left. I elbowed him off, then corrected course. Alarms rang in the cockpit. Jerimon shoved Leon backwards and followed, landing on top with a loud grunt. "Twinkle, follow a course of nine three seven," the worried voice said slowly. "Can you do that?" "He did something to the controls." I jiggled the steering in what I hoped looked like uncontrolled shifting. An ore tanker lurched into view. I swerved around it. Jerimon and Leon rolled into the wall. More alarms went off, none of them serious. I watched carefully to make sure I didn't push anything into the red. "We're sending ships to intercept you," the worried voice said. I shoved the throttles forward, trying to pick up speed. It was time to leave. I suddenly realized we had no course set. We couldn't jump to hyperspace without one, the ship's safety circuits wouldn't let me. I bit my tongue to keep from swearing. I twisted the ship around in a tight loop. "Twinkle, acknowledge," the worried voice urged. "Heading nine-three-seven. Repeat, nine-three-seven." I shifted away from that heading. I didn't want Patrol interception, not until I knew what trouble was currently sitting in my cargo bay. Jerimon slammed Leon's hand against the floor. The gun went off. I ducked as the bolt raced over my head. It reflected off the viewscreen, bounced off the bulkhead twice, zipped past Jerimon's ear, and caught Leon straight between the eyes. Leon went limp. Jerimon yanked the gun from his hand and stared disbelievingly at it. "What is this? You knew all about this peashooter, didn't you?" He tossed the stunner onto the bunk. "Twinkle, respond!" the worried voice demanded in my ear. "Dace," Jerimon said as he loomed over my chair, "what game are you playing?" I jerked the ship onto a new course, flinging Jerimon into the copilot's chair and sending Leon's limp body smacking into the wall. I pulled off the headset, punching the cutoff for the com. "Fly, unless you want to end up in prison." This has been fun, even though I was late! I couldn't do the scavenger hunt because blogger and my iPad won't play nice. I hope I can get on a real computer and do it before the deadline. What a great idea. Hope you had a fun time too! It's been a blast coming up with questions. And I had an excuse to hang out in a rock shop looking for prizes. That's always a good thing, unless you're my wallet. Thanks for coming, Angie! Can I still get a Cthulu Cat toy for my son to take to playgroup? All the other babies steal his rattles. Yes, I still have some to buy.